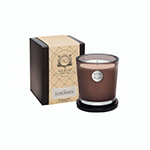 Aquiesse Luxe Linen Large Candle brings in the joy of sun-drenched linen. Infusions of relaxing sandalwood and herbal tea create an essence as warm as a Southern California summer. Sweet & intoxicating. Elegant, ultra-thick glass in smoke brown complements every style. Custom, heat-resistant cover doubles as a chic pedestal and can also be used to safely extinguish the candle and protect from dust when not in use. Part of the Aquiesse Portfolio Collection.